Rose Under Fire starts off in a difficult position. Elizabeth Wein's previous novel Code Name Verity received astronomical levels of praise. Hard to follow that. Also, Rose Under Fire deals with the Holocaust. Always a difficult topic because of its horrific nature, but also because there are so many Holocaust novels that it's hard to write anything new. Thankfully, Rose Under Fire is a strong follow-up to Code Name Verity and sets itself apart from the myriad of Holocaust novels. The book is told in an epistolary style somewhat similar to Code Name Verity, although actually quite different. It goes back and forth between time. We learn very early on that Rose survives the War. We read about her life before being captured by the Nazis, her imprisonment at Ravensbruck, and the mental and physical scars that remain with her after the War. Rose is a plucky girl as an American pilot flying out of England. She is daring and gutsy, as any volunteer pilots in that day would be. But she also feels very young. She is forced to grow up very quickly when imprisoned in Ravensbruck. She continues to be brave and defiant towards her captors. But what made her character feel more real was that she wasn't always the brave, cheerful one. She relied on other people as much as they relied on her. The heart of this book is about the relationships that Rose develops at Ravensbruck with a group of Polish political prisoners. They lived to help each other survive. They became closer than family. Supporting the weak. Finding opportunities to bring a smile or a laugh to maintain their sanity. The friendship is such a central part of the book that it was possible to forget for a few moments that the events were taking place in a concentration camp and merely find happiness in such a beautiful relationship (well, not really, but it was the part of the book that stuck with me the most). None of the horrors of the concentration camp is spared. There is constant cruelty, illness, and risk of death. The book also goes into detail about the medical experiments performed on Polish prisoners, known as Rabbits, something I was aware of but hadn't read about in a novel before. Much like Code Name Verity, there are "bad" people portrayed as three-dimensional characters. Anna, one of the prison guards who helped with the medical experiments, was a prisoner herself and was a significant reason that Rose survived. 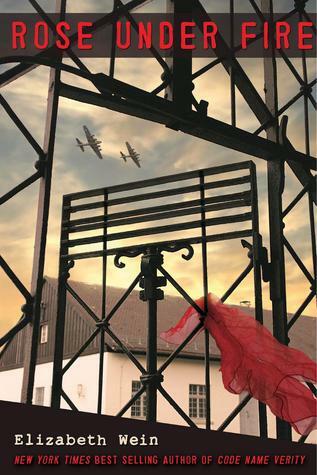 Rose Under Fire is a very difficult read as all Holocaust books are. I like that the horrors are dealt with in a no-hands-barred manner. But at the same time, I never felt like anything was played up for shock value or to screw with my emotions. It was all very straight forward. Rose Under Fire is a beautiful, touching, heart-rending novel. If it wasn't for Code Name Verity, I would have thought it was a perfect book. Code Name Verity is one of the best books I've ever read. It is so unusual, so shocking that it set an impossibly high bar. Rose Under Fire is wonderful, but it didn't stick with me in the same way that Code Name Verity did. All in all though, if a book comes close to being as good as a near perfect novel, it's done pretty well for itself. I can't really imagine doing so well with your debut and having to follow it up. But so fantastic that the author was able to do so! Holocaust books are ALWAYS difficult to read because of, well, everything about that time period but this sounds worth the pain. Hmm, not sure if I can read this. Holocaust books are hard. I've been trying to work up to read The Book thief for fear of crying. I am so with you on your review! Loved both Code name verity and Rose Under Fire so much. I was in the minority who felt underwhelmed with Code Name Verity. The stylistics got in the way for me to really get into the book and enjoy it. I'm glad this one is written in a different format. I definitely plan to make time to read this before the year is over. I just reviewed Rose Under Fire yesterday lol! I like what you said about Rose being forced to grow up - I never really thought about it that way but she definitely did mature over the course of the novel. I thought it was a brilliant novel that deeply affected me. It's true, Code Name Verity is a very hard act to follow! So I think it says volumes about how good this follow up was that you still felt it was a strong read (if not quite as good as CNV). I still need to read it myself! But I'm very pleased you loved it.